July 16, 2015 Fact of the Day: What is the #1 worry for affluent investors? DID YOU KNOW THAT CLIMATE CHANGE IS NOT THE ISSUE MOST WEALTHY AMERICANS ARE THE MOST CONCERNED ABOUT? In research recently conducted by Spectrem Group with affluent investors nationwide, it was found that while Climate Change is a concern for many households, it is not their biggest concern. The biggest concern was the threat posed by ISIS and terrorists. Thirty eight percent of investors identified this as the most important current event. 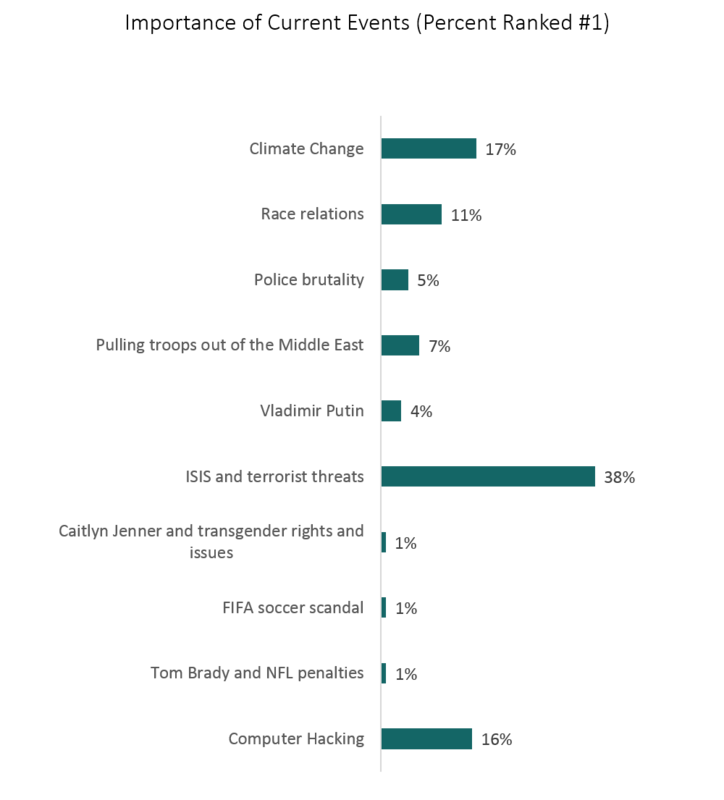 Climate change came in second at 17 percent and was closely followed by Computer Hacking at 16 percent. Race relations were the most important to 11 percent and Pulling troops out of the Middle East was identified by 7 percent. Vladimir Putin is a concern for 4 percent and police brutality is at 5 percent. The FIFA soccer scandal, Tom Brady Deflategate, Caitlyn Jenner and transgender rights all pulled in 1 percent of investors. Older investors were more concerned about ISIS while younger investors worried about Climate Change and Computer Hacking. Republicans and Independents were more worried about ISIS while Democrats were worried about Climate Change and Race Relations.